The Quarter Turn Cube looks like a regular Rubik's Cube. The difference is that the faces do not turn entirely freely. Each face can turn a quarter turn in one direction only, and after a face has moved it can only turn back a quarter turn. There are two versions of this puzzle. In the one designed by Katsuhiko Okamoto and Takafumi Haseda the turn blocking mechanism is made visible by stickers on face centres. 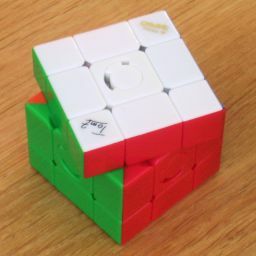 In the version designed by Tom van der Zanden, released as the Constrained Cube (90°), the turn blocking mechanism is directly visible. The Constrained Cube has several variants where faces are constrained to move by amounts other than a quarter turn. The restrictions on the turns does not reduce the number of possible positions of the edge and corner pieces compared to a normal Rubik's Cube, which is 12!·8!·212·38 / 12 = 43,252,003,274,489,856,000. Each face centre however is in one of two visible orientations. The total number of possible face centre orientations is 26, however the parity of the number of twisted centres must match the parity of the corner (or edge) orientation, so that means that the total number of positions is 26·12!·8!·212·38 / 24 = 1,384,064,104,783,675,392,000. Note that for each of the 26/2 = 32 even centre orientations the puzzle can be solved. The standard Rubik's Cube notation will be used. The six faces Front, Back, Up, Down, Right, and Left are denoted by the letters F, B, U, D, R, L respectively. A clockwise quarter turn of a face is denoted by the face letter, an anti-clockwise turn by the face letter with an apostrophe. The location of any corner piece is denoted by a triplet of face letters, namely of the three faces that are incident to that corner. Similarly any edge piece location is denoted by the two letters of the faces that meet along that edge. Phase 0: Solve the face centres. For each face, turn it anti-clockwise if possible. Now every face can turn clockwise but not anti-clockwise. Note that all the move sequences in this solution leave the centres in this state - every clockwise turn in a move sequence is undone later on in the sequence. This means that all move sequences have an even number of quarter turns. It is impossible to swap two edges and two corners in this way due to the parity constraint. In other words, this solution assumes that when you bought the puzzle, it was in a solved state with an even number of centres twisted one way and an even number twisted the other way. This is the most common case, but it could be that your cube had an odd number of each. In that case you will need to twist the D face clockwise, and in the rest of the solution avoid twisting that face. Hold the puzzle with the white centre at the bottom, in the D face. 1. If it lies in the D face, hold the puzzle with that piece at the RD location, and do FRF'R' which brings it to the UF location of the top layer. 2. If it lies in the middle layer, hold the puzzle with that piece at the FR location, and do RUR'U' which brings it to the UR location. 1. Hold the puzzle with the edge at the UF location. Hold the puzzle with the edge at the UF location. Find the piece's home location on the bottom layer. If its home location is at RD, then go to the next step, otherwise do FUF'U', and try this step again. Move the piece from UF to RD by using the moves RFR'F. Repeat steps b-e until all bottom layer edges are correct. - if the piece lies in the top layer then it is correctly oriented if its yellow sticker is in the U face, and flipped if its yellow sticker lies in a side face. - if the piece lies in the middle layer then it is correctly oriented if its yellow sticker is on its left, and flipped if its yellow sticker is on its right. For example, if the edge at the BL location has its yellow sticker in the L face, then it is flipped, because that is the right-hand side of that piece. - if the piece lies in the top layer then it is correctly oriented if that sticker is in the U face, and flipped if that sticker lies in a side face. - if the piece lies in the middle layer then it is correctly oriented if that sticker is on its left, and flipped if that sticker is on its right. 1. To flip UF and UB, do F RUR'U' F'. 2. To flip UF and UR, do F URU'R' F'. Use this to fix any pairs of flipped edges in the top layer. If there is a flipped edge in the middle layer, then you can bring it to the top layer. Hold the puzzle with the edge at the FR location and do RUR'U'. If you now have two flipped edges in the top layer, go back to step b to fix them. If not, then repeat this step to bring another flipped edge to the top. Phase 3: Position the remaining edges. If there is at least one solved edge piece in the middle layer, then skip to step c.
1. Find a middle layer edge piece that lies in the top layer. If there is no such edge piece then do RUR'U'. 2. Hold the puzzle such that the edge piece lies at UB. 3. If it belongs at FR, then do RUR'U' to solve it, and go to step c.
4. Do URU'R' to move the edge piece around the U layer, and go to step 2. Hold the puzzle such that the previously solved edge lies at BR. 1. Find the edge piece that belongs at UB. If it is already correct, go to step e.
2. Hold the puzzle so that this edge piece lies at FR or UR. 3. Do RUR'U' to move the piece closer to its home location. 4. Repeat steps 2-3 until the piece is solved. Hold the puzzle such that the previously solved edge lie at UB. 1. Find the edge piece that belongs at FR. If it is already correct, go to step g.
2. If it the edge piece lies at UR, then do UFU'F'. 3. Do RUR'U'. This temporarily puts the previously solved UB piece at the FR location. 4. Hold the puzzle so that the edge piece you are solving lies at FR or UR. 5. If its home location is now at FR then put it in place with URU'R', which also restores the UB edge, and go to step g.
6. Do RUR'U' to move the piece closer to its home location. 7. Repeat steps 4-6 until the piece is solved. Repeat steps c-f twice more, so that you have only 3 unsolved pieces left. Hold the puzzle such that the unsolved edges lie at FR, UR, and UB. 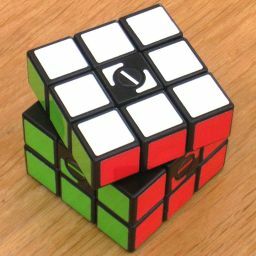 Do RUR'U' once or twice to solve the FR edge. If you find that the final two edges need to be swapped, then it means that the face centres are not correct. Go back to phase 0 and start with one of the face centres twisted the other way. Phase 4: Position the corners. In this phase the corners are placed correctly, without worrying about their orientations. Only one move sequence is needed, namely RFR'F' L FRF'R' L', which cycles the three corners UBL->UFR->UFL->UBL. Its inverse, L RFR'F' L' FRF'R', which cycles the three corners in the other direction UBL->UFL->UFR->UBL also comes in handy. Choose one of the corner locations that you want to solve. If some corners are already in their correct locations, then try to choose a location adjacent to them such that the other unsolved locations remain as one connected region. It may be that the unsolved corners are already separated into non-adjacent regions. If that is the case, then in what follows you should treat one of the apparently solved corners as if it were unsolved, so that the unsolved corners form a connected region. Find the corner piece belonging at that chosen unsolved home location. If possible, hold the puzzle so that the corner piece, its home location, and one other unsolved corner lie at UFR, UFL, and UBL, in any order. If that is not possible, use the corner piece and two unsolved corners. Apply the move sequence or its inverse once or twice so that the corner piece is solved, or if that is not possible then at least closer to its home location. Repeat a-d until all the corners are solved. Phase 5: Orient the corners. Once again only one move sequence is needed, namely RFR'F' RFR'F' L FRF'R' FRF'R' L', which twists the UFL corner anti-clockwise and the UBL corner clockwise. Its inverse, L RFR'F' RFR'F' L' FRF'R' FRF'R', twists UFL clockwise and UBL anti-clockwise. Choose one of the twisted corners, preferably one that is adjacent to as few other twisted corners as possible. Look at the three corners adjacent to the first chosen one. Choose one of these three, preferably one that is twisted itself, or if that is not possible then one that is nearest to some other twisted corner. Hold the puzzle so that the first chosen corner lies at UFL, and the second corner at UBL. Apply the move sequence or its inverse once or twice so that the first corner piece at UFL is solved.